Location: Fronting the hotel is Jing An Temple and Jing An Park and discreetly tucked away behind a bamboo screen in middle of jumping Jing An, The PuLi Hotel and Spa manages to be in the heart of the hustle while at the same time feeling like your very own hideaway. Wake up at the crack of dawn to join Shanghai’s senior community as they gather in neighbouring Jing’An Park each morning to practice their t’ai chi. Year round, Shanghai’s urban parks are loaded with activity such as intense games of Chinese checkers and opera singing. Style: This is a destination for the quietly confident. At the 32-metre-long, dark-timber bar that doubles as reception, you may rub shoulders with global executives, Italian film-producers and international style-makers, all over a signature cocktail of gin, elderflower and jasmine tea. Gazing through the floor-to-ceiling windows at the reflection pool and bamboo-filled courtyard outside, you're met with a space that could be the backdrop for a Tom-Ford campaign: polished black stone floors, minimalist lines and spotlighted antiques. Rooms: Comprising of 229 rooms and although not the largest abodes in Shanghai, we adore the corner Grand Studios, which have impressive views of the park and city from the king-size bed, living area and bath tub. There’s a cosy window seat complete with a tea set and all of the suites are filled with an slick mix of modern dark wood furniture, Han Dynasty statues and sliding silk screens. Tech-heads will love the home cinema system and those seeking zen will appreciate the incense amenity. 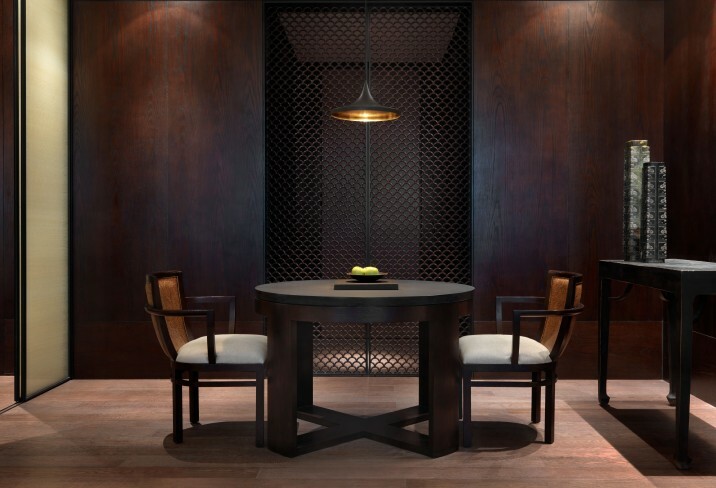 Spa: Anatara Spa and Wellness lend their stellar services to The PuLi Hotel, offering up their outstanding signature Thai treatments in an elegant space. The spa serves up some of the best massages in town (we love the Anantara 90 minute signature), accompanied by a menu inspired by the restorative power of tea in treatments such as green tea wraps, white tea scrubs and rose tea beautification packages. Follow up with some serious tranquility in the steam room and sauna, then soak away remaining stress in the Jacuzzi. The gym is also equipped with state of the art machines for fitness buffs. Dining: Spread over three dark-wood pavilions looking to Jing'An park, the hotel's Michelin Starred restaurant Phenix is clad with eastern objets d'art, handspun rattan and silk upholstering. Australian chef Michael Wilson (formerly of Melbourne institution Cutler & Co), presents a seasonal and changing menu dotted with Asian influences. Try the sweet corn custard tart with brown crab and the crispy scale red sea bream with artichokes for truly satisfying dishes. Save room for a pandan rice pudding which is delicate and delicious. Bar: Running the full length of the lobby, the 32-metre Long Bar boasts one of Shanghai’s most extensive by-the-glass wine menus. Snag a spot on the sunken day-beds or perch yourself at the bar and people watch the hotel lobby. Try the Sichuan Spice cocktail for a kick. Pool: The indoor infinity pool is 25 metres long and glides along floor to ceiling windows that overlook Jing’An Park. Great spot to start the morning as the sun rises.